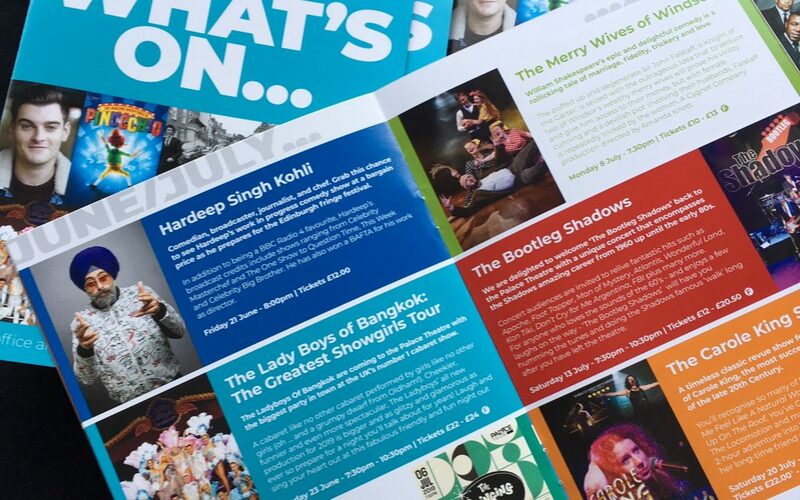 Over 40 different shows and more than 100 nights of entertainment are listed in our new summer programme! Please do call in and pick up your copy. Or browse through online. It’s always an exciting time here at the theatre as we confirm dates with some fantastic local and touring companies as well as celebrities and musicians from across the UK and beyond. We’re very excited to be welcoming Jonathan Dimbleby’s BBC Any Questions?, TV comedian Hardeep Singh Kohli, Strictly’s lovely Len Goodman (one of just two UK dates) and many others as well as firm favourites on the Palace calendar such as our annual Agatha Christie which this year is the mysterious tale ‘Black Coffee’. If you know of anywhere that can display our leaflets, please let us know and we’ll deliver. And as our brochure says…Take your seat and enjoy the show! Palace Theatre Paignton – a busy community theatre in the heart of Devon, minutes away from Torquay, Brixham, Totnes and Newton Abbot. Wheelchair access, bar, and easy to get to by car, by bus or by train.